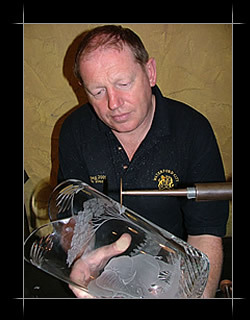 Sean Egan began his apprenticeship as a cutter with Waterford Crystal in 1974. He qualified and worked as a master cutter for some years. In 1984, when the opportunity arose in Waterford Crystal to train as an engraver, Sean, who was always good at art, jumped at the chance. Sean started his 5 year apprenticeship and then spent a further 5 years training to become a Master Engraver. During this time he also attended night school, for 2 years, in the local Art College. As a master engraver and cutter of consummate skill, Sean has a prodigious output of work to his credit. His work is much sought after for its inspirational and dedicated themes, and sheer quality of craftsmanship. He has a natural ability, and is renowned for his depictions of wildlife scenes and marine life. Sean spent over 35 years with Waterford Crystal where he worked on many famous trophies such as Players Championship (golf), Cricket World Cup Trophy, Hockenheim Prix Trophy and the Volvo Ocean Race. Sean also created the Fr Michael Judge 9/11 Sculpture which was presented to FDNY in 2007. Since opening Sean Egan Art Glass he has been commissioned to create many challenging and exciting projects. Most notable in 2011 he was commissioned to create the “Miracle of Stairwell B” Sculpture for the 10 year Anniversary Service held in Dublin by Ambassador Dan Rooney. He was also commissioned by the Irish Prime Minister to create the famous Shamrock Bowl which was presented to President Barack Obama on St Patrick’s Day in 2012. Please visit the projects page for full story on these projects and many others. In 2004 I was dispatched to Florida to engrave the name of the winning golfer on the Players Championship Trophy (Waterford Crystal). You are waiting around all week to do five minutes work, and people kept asking me was I nervous about engraving the winner’s name. They asked so many times I started to think- should I be nervous? As Adam Scott walked up the 18th with a comfortable lead, I got word to start engraving the young Australian’s name on the trophy. I was almost finished his surname when someone shouted in my ear “STOP! !”- Scott had put the ball in the water. Complete panic! To hear my thoughts on the Adam Scott affair and also about my time as a glass engraver please listen to my radio interview which was broadcast in 2010 on Today FM.